Washington (CNN) – Republican Sen. Rand Paul of Kentucky told a crowd of social conservatives Wednesday that fighting within the GOP is for the best. Although Paul pointed out that the debate should not be “impolite” or “rude,” his comments go against what certain Republicans in office have said in the past: That party fighting and vocal disagreement only help Democrats and President Barack Obama. Following his own advice, Paul took shots at certain unnamed Republicans, knocking them for not focusing enough on cutting spending, while touting his own credentials. Paul’s remarks came at a gala for the American Principles Project, a unique Republican group that bridges the ideas of social conservatives and libertarians, a group Paul identifies with. The Republican Senator also touched on raising the debt ceiling, a debate that is likely to come up again in Washington because within the next month or so, Congress will be asked to raise the debt ceiling in order to not default on the government’s debts. The federal government effectively hits its debt limit on Friday, but through “extraordinary measures,” the Treasury Department has some payment flexibility that extends the need to raise the debt ceiling month or so. As is the case with most Paul events, presidential speculation came up. Much of Paul’s laugh-line filled speech stayed away from social issues. In the one nod Paul gave to abortion and protecting the right to life, the audience broke out into applause. Instead, Paul dedicated much of his time addressing economic policy, slashing spending and the future of the Republican Party. Herbert Hoover economics was a train wreck, and Rand is in the engineer's seat. Paul is one to talk. He has caused problems in the party. 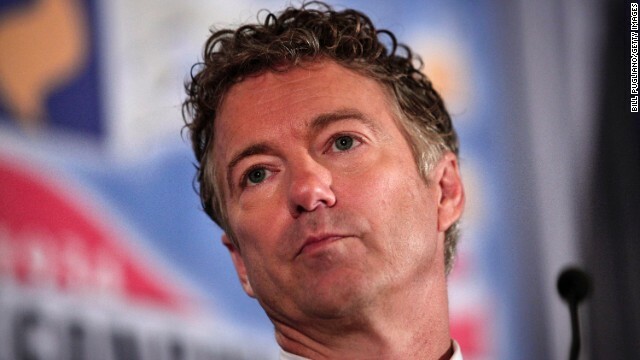 Paul should be a part of the Libertarian party and not caucusing with the GOP in the Senate. He doesn't represent the GOP and poorly represents the state in the Senate. Lol, Yes please do continue the infighting. The definanation of a GOP moron--–bland Paul back bencher!!!!!!! "Although Paul pointed out that the debate should not be “impolite” or “rude,” – really???? It hasn't caused him or any other GOP/TP member from being disrespectful, impolite and [frankly] downright rude to the office of President has it. Why not Patrick Duffy? He is just as qualified... .
HIARIOUS watching the Guns Over People tea potty walk the plank toward November. Don't change one single thing bumpkin wingnuts,everything is fine. Says the guy who is motivated by money and ayn rand's life. We the US are optimistic that you and your kind are out of congress for life so that we can get back to politicians who are not for themselves but the people they serve and who elected them. In the meantime, go to the corner and be quiet! Ya bland , the fighting does NOTHING for your idiot party full of the garbage and sewage of America except keep it moving BACKWARDS!!!!!! You guys are absolutely screwed! Their plan, agree to give the Democrats something, and get something during the budget, then when its time to pay that bill, demand the Democrats give something back, brilliant! See you in November fools . Republican infighting is a good thing, it's amusing, and shows the stupidity of the candidates' race to the extreme right to get support of the base of intolerance and hate. How'd that kerfuffle between you and Christie work out Rand?